From CA And IN Warehouse. 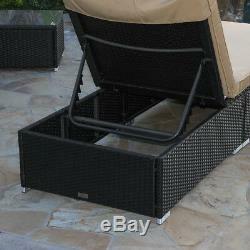 Adjustable Pool Chaise Lounge Chair Outdoor Patio Furniture PE Wicker W/Cushion. Create a sophisticated outdoor space with a Wicker Patio Chaise Lounge. This outdoor chaise lounge has clean, classic lines that give your space an air of enduring elegance. Perfect for outdoor use, the patio chair is made with all-weather resin wicker that resists fading and durable metals that resist rust. Your guests will sink into the comfy cushions that are covered with soft yet hardwearing fabric and resist stains, water and fading. Mix and match this outdoor patio furniture with other pieces for an outdoor space as comfortable as your indoor one. Perfect Setting - Ideal for patio, porch, backyard, poolside or garden. So you can relax poolside with your loved one. Relax - The perfect backdrop on which to read, nap, tan or just think about your day, this piece enhances your life in a soothing way, and it features a sturdy iron frame and weather-resistant cushion, ensuring durability despite frequent contact with the elements. 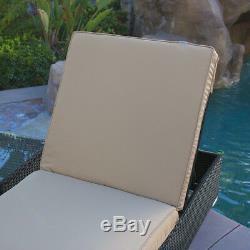 Weatherproof Cushion - Weatherproof cushion covers repel minimal water and moisture. 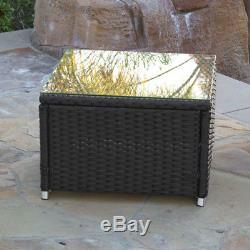 Side Table - The glass topped rattan table is durable. 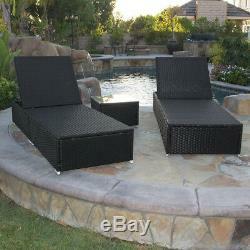 Place a book and drinks on the table and relax on the patio with this wicker outdoor furniture set. Adjustable Back - Catch some rays and relax in stylish comfort with this contemporary chaise lounge. The adjustable chair, which is surprisingly simple in its design, is a great addition to decks, pools, patios and backyards. Tigthtly-Woven Wicker - Excellent hand-weaving technique with a fashionable design perfect for the patio deck or poolside. Comfort Cushion - Each cushion is extra thick for added softness, and they are made from weather resistant and UV resistant materials, so they are built to last. 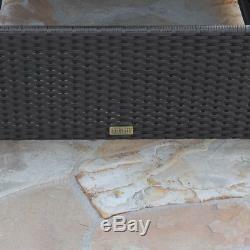 UV Protection - UV protection added to wicker to prevent fading. Lightweight Frame - Constructed from a durable lightweight aluminum frame, easily reconfigurable to various layouts. Lounger Height w/o Cushion: 14. Table Dimension: 20"(W) x 20"(L) x 13-1/4(H). 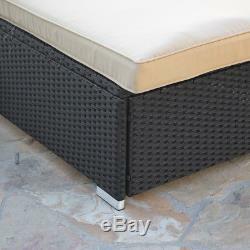 Each Lounger Size: 77"(L) x 28"(W) x 17"-39"(H). NOTE: Our digital images are as accurate as possible. However, different monitors may cause colors to vary slightly. Founded in the heart of Los Angeles California, our 400,000 sq/ft warehouse houses thousands of the most comprehensive collection of household tools, home & garden and aftermarket automotive items to fit any of your needs. TheEveryMart works closely with product manufactures, eliminating middlemen so we can pass the savings onto you. We look forward to building upon our tradition of excellence by continuing to provide exceptional products and services. From California - Los Angeles. Protective packing materials will be added in your package at no cost if needed. Assures our customers that they will receive all orders promptly and exactly as described. Used items will not be accepted for return. Under no condition will TheEveryMart be liable for any damages, and in particular will not be liable for special, indirect, consequential, or incidental damages, or damages for lost properties, revenue or use, arising out of or related to the TheEveryMart account or the information contained within it, whether such damages arose in contract, negligence, tort, under statute, in equity, at law or otherwise. Who do I contact if I receive a damaged product? If your product is damaged, you may use the contact form provided. We have warehouses in California and Indiana. How long until my order ships? How do I cancel my order? You have 24 hours from the time you place your order to cancel. Do you deliver on weekends? Why isn't my coupon working? Your coupon may have expired. Only one discount applies per order. Are there promo codes / coupons available for me? As a member of the Belleze community, you may receive special discounts and promotional codes from time to time. You may also see discounts on banners and notifications on our web site. Do you have a showroom? We do not offer installation services. I received an incomplete order missing parts, manual, etc. Why was my order cancelled? This listing is currently undergoing maintenance, we apologise for any inconvenience caused. The item "Adjustable Pool Chaise Lounge Chair Outdoor Patio Furniture PE Wicker WithCushion" is in sale since Tuesday, September 11, 2018. This item is in the category "Home & Garden\Yard, Garden & Outdoor Living\Patio & Garden Furniture\Patio Chairs, Swings & Benches". The seller is "theeverymart" and is located in Rowland Heights, California. This item can be shipped to United States.